Gufufoss waterfall in Iceland is like the long lost twin of Skogafoss waterfall. 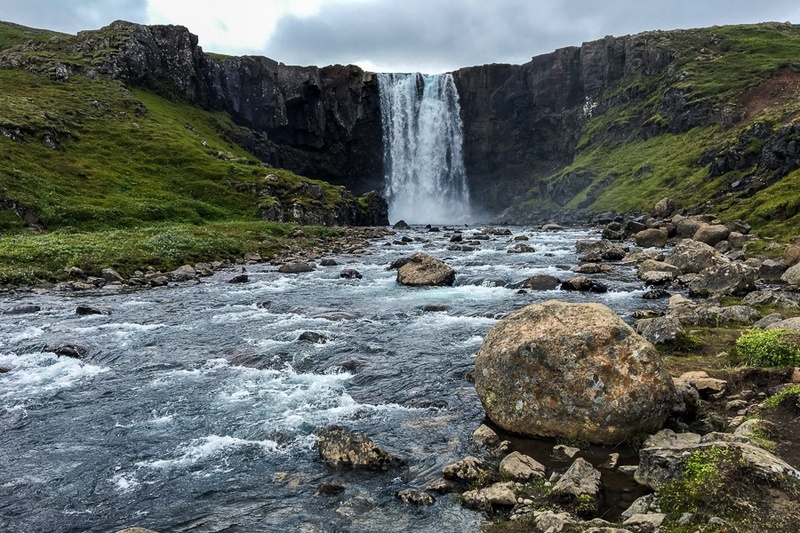 The wide falls end in a rocky river that makes it look really similar to Skogafoss, and the cliffs surrounding the waterfall even look the same. The major difference is that this one is remote and MUCH less crowded. Skogafoss usually has hundreds of visitors at any given time, but Gufufoss was completely empty when I went there. At Gufufoss, it’s also possible to hike up to the top of the cliff and take photos from there, but I was content to just take photos from the bottom by the river. This is a great place to stop and stretch your legs if you’re getting exhausted driving through east Iceland. Gufufoss is about 430 miles (700 km) from Reykjavik, way off in eastern Iceland, and it’s a short detour from the Ring Road. You don’t need 4 wheel drive to visit Gufufoss; any 2 wheel drive vehicle can reach the parking lot, where it’s just a 5 minute walk to the waterfall. No parking fee or entrance fee is required.